"A delicious blend of chicken, rice, and vegetables. Perfect as a meal, or to take the edge off hunger between meals. Excellent winter warmer." In a large saucepan over high heat, combine 4 cups water and the chicken broth and bring to a boil. Add the chicken, carrots, onion, celery and bouillon and reduce heat to low. Cover and simmer for about 15 minutes or until the vegetables are soft. Add more water as necessary. Add the rice and allow to simmer for another 15 minutes, or until the rice is tender. Add salt and pepper to taste. Go wild for comforting chicken and rice! Do not add too much rice or it may become gluggy. It is incidental, not essential to the outcome. This was the best soup ever, I used brown rice instead of the white, but it was excellent. I made it at work in a crock pot. All the other employees wanted this recipe. The suggested thyme, bay leaf and sage are an absolute must for terrific flavor. We really enjoyed this recipe. Thanks! 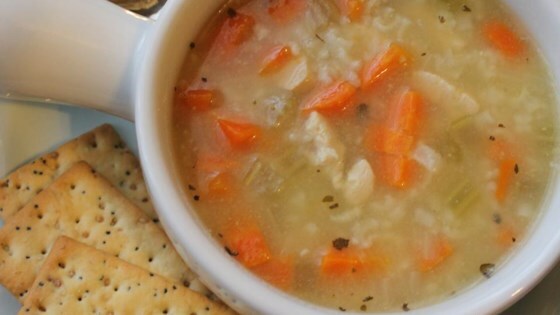 Very quick and easy soup to make. My family loved it. I added the thyme, bay leaf and sage also and it turned out great.